Dahlia Darling by Sandy Haight. Watercolor. Image size: 30″x 22″. Frame size: 39″ x 31″. Opening reception: Thursday, November 16, 5-8pm. I’ll be there! The annual Holiday Art Show will feature works by Signature members of the NW Watercolor Society, NWWS, as well as glass and ceramic gifts by regional artists. “Inner Sanctum” Watercolor. Image size: 30″ x 22″. Frame size: 39.5″ x 31.5″. When: June 15 to September 2, 2017. Reception: June 15 from 5:00 – 8:00. I’ll be there until 7:00pm. If you love your garden, love art or have dreams of garden delights, come to this show and look for this big pink peony among all the creations! 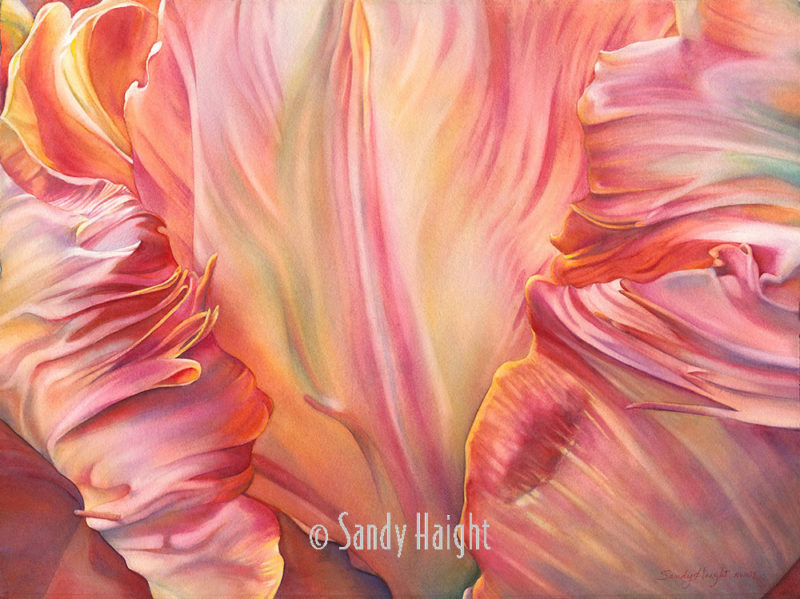 “Persistence of Pink” – New work! “Angelique” Watercolor. Image size: 30″ x 22″. Frame size: 39.5″ x 31.5″. 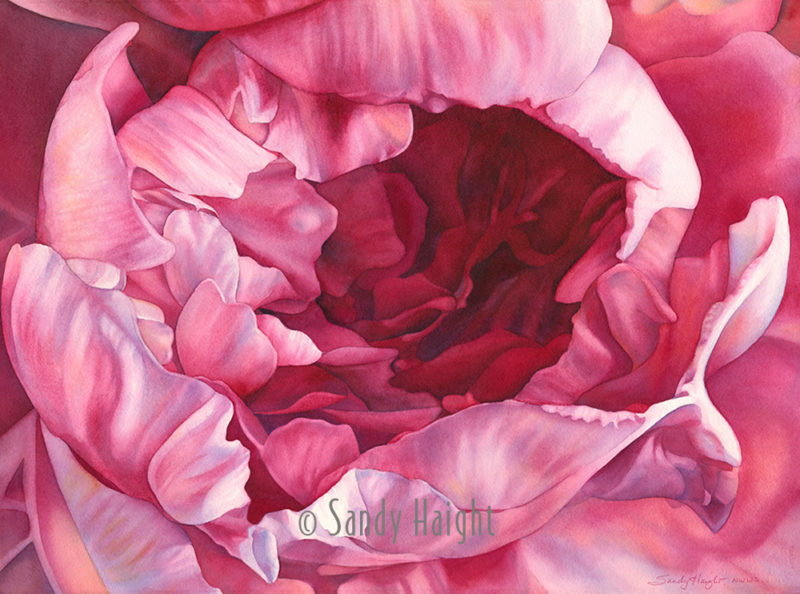 After last year’s Skagit Tulip Festival I fell in love with the color PINK. 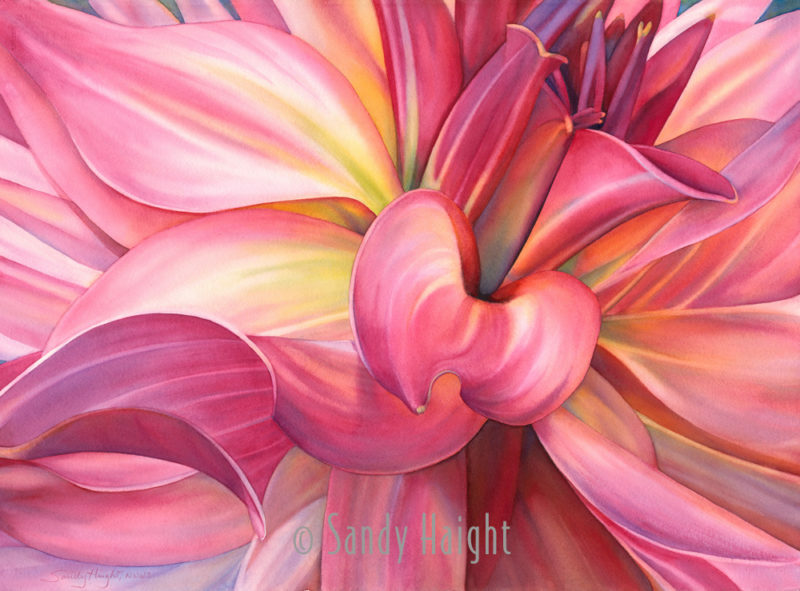 All the new flower concepts I was eager to paint seemed to be primarily pink, as if I was a little girl again. But I wanted to make them BIG and bursting. Pink isn’t just for little girls! These bold NEW WORKS are introduced and highlighted in my upcoming April show of 10 pieces at the Scott Milo Gallery in Anacortes, Washington. “Dahlia Darling” Watercolor. Image size: 30″ x 22″. Frame size: 39.5″ x 31.5″. “Undulation” Watercolor. Image size: 30″ x 22″. Frame size: 39.5″ x 31.5″. “Aglow” Watercolor. Image size: 30″ x 22″. Frame size: 39.5″ x 31.5″. The show at Scott Milo Gallery features the current Skagit Valley Tulip Festival poster artist Trish Harding, and 3 former poster artists, myself – Watercolor, Randy Dana – Color Photography, and Brett Varney – Pastels or Oils. A wine festival and quilt walk will also be happening the night of the reception on Friday evening April 7, and the fields of Skagit should be persistently blooming with tulips…of all colors! 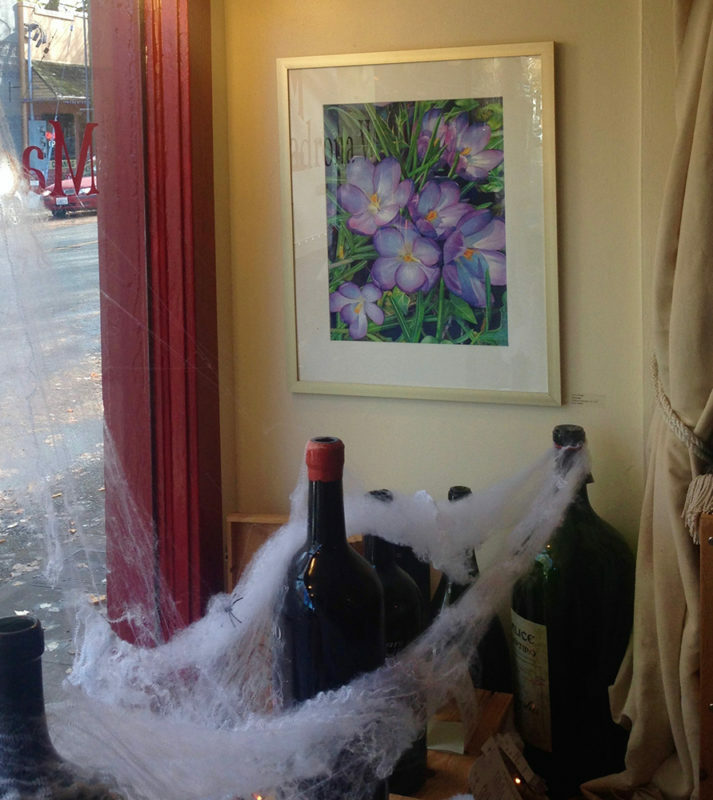 “Crocuses” in the wine shop window. 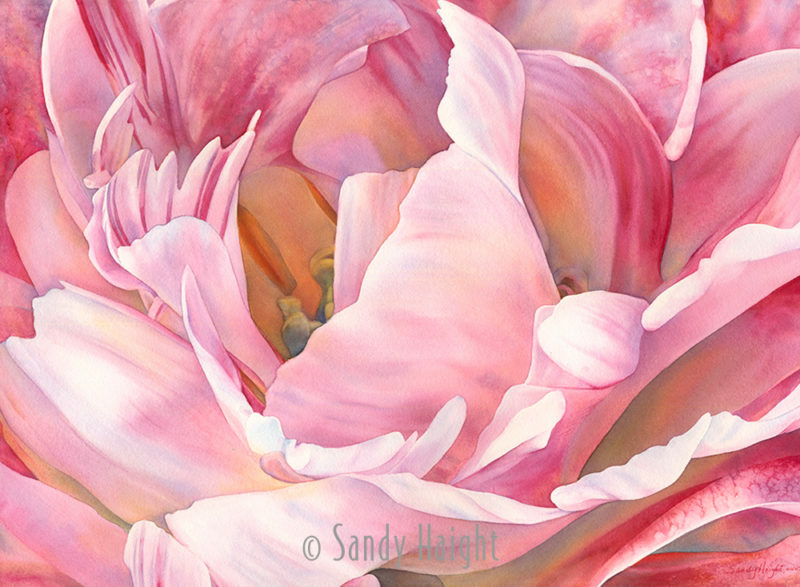 Original watercolor by Sandy Haight. 21″ x 26″ framed. 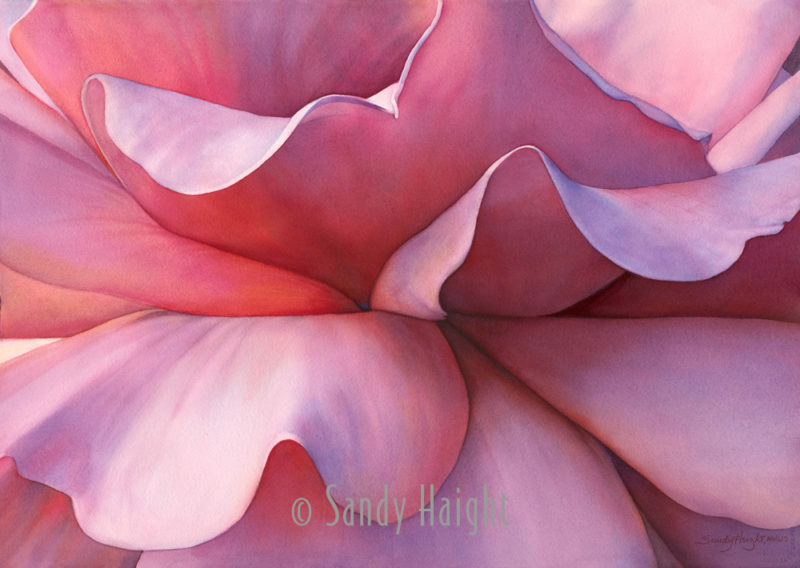 Sampling of framed giclee Floralscapes by Sandy Haight. Giclee frame sizes 14″ x 11″ and 20″ x 16″. Give a gift of flowers that won’t wilt in a week! Pair it with a great bottle of wine! 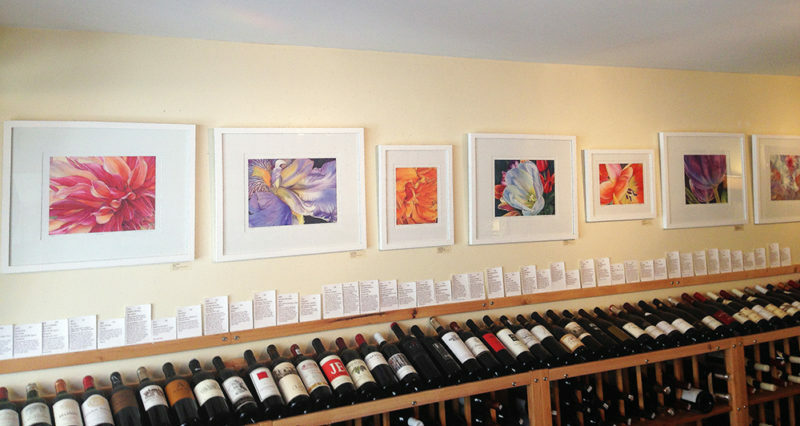 Join me at Madrona Wine Merchants this Sunday, December 11 from 3 – 5pm for a wine tasting reception. Framed giclee prints of my Floralscapes are displayed and available for you and your holiday gifts along with a few original paintings in this intimate space. This show will be up through the end of December. If you don’t see your favorite flower from my series as a print, please contact me. I can provide any sized archival giclee print to fit your unique space, even bigger than the original, or on stretched canvas! See them all on my web site!